On April 15th, 1991, Colony One Auto Center opened their doors for business in Fort Bend with the goal of delivering the best automotive service to a growing community. Founder Sam Tate made sure that this goal was met by treating every customer as he would have liked to be treated. This empathetic approach was also instilled with his business partner, Rick Hanson. Sam Tate’s start in the auto business was opening a Texaco service station in 1971 on the corner of Bellaire and Wilcrest of Alief, Texas. The station gradually became known as Wilcrest Automotive, the first AAA approved independent repair facility in Texas. This was also where Sam and Rick Hanson began their working relationship. Rick was hired to be a service technician. They then grew this relationship into a partnership with the opening of Colony One Auto Center. Sadly, Sam passed away in 1999 leaving the business to his son, Rod Tate, to continue his legacy. Rod had been a part of the business since 1995 and with the passing of his father rose to the duty of leading business operations. Today, Colony One is still owned by the Tate Family with Rick Hanson as his business partner. Rod and Rick continue to oversee operations on-site with a hands-on approach and responsibility to our customers, employees and community. Some things should never change—for us it’s treating every customer the way we would like to be treated. It’s this belief that truly makes us different from the other chain stores and dealerships where you’re just a number or an opportunity to sell a service. Colony One Auto is a modern day, state-of-the-art automotive repair and maintenance center that still retains the level of commitment and friendly service as car shops of yesteryear. Automotive technology is advancing at breakneck speed and the technology used at Colony One are not only up-to-date, but also constantly advancing. We want all of our customers and friends to have a great experience from the moment they walk into Colony One Auto Center. Whether you’re a first-time visitor or a repeat customer, we want you to feel comfortable leaving your vehicle in our hands. 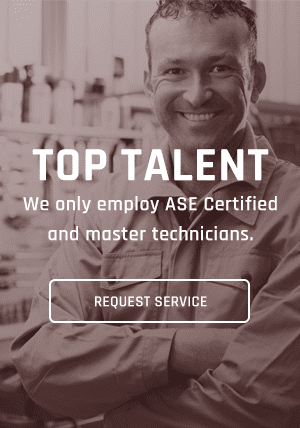 Our staff of ASE-certified techs has over 250 years of collective experience in the automotive service industry, so you know you’ll be getting the best service possible. Colony One Auto is proud to be recognized by the National Institute for Automotive Service Excellence as a Blue Seal of Excellence Repair Shop. To achieve this recognition, Colony One Auto employs only technicians who are ASE-certified. Almost everyone on our technician staff has gone a step further and received a master certification. Colony One Auto has a continuing training program for all technicians, including seminars with AC Delco, Motorcraft, Chrysler, Toyota, the Carquest College and Jendham training. Colony One Auto Center will be here to service your vehicles for many years to come, and to do this we will always support continuous training of our staff. Colony One Auto Center is also an authorized AAA repair facility. AAA recognizes the best in auto care and support. In order to be an authorized AAA repair facility, we are required to have a high customer satisfaction ranking and we are evaluated through an in-depth survey. AAA takes a cross-sectional sample of our customers and gives them a questionnaire. Colony One Auto has scored a 100% customer satisfaction for the past several years. We also are members of the Better Business Bureau (BBB) and the Automotive Service Association (ASA). We are recognized both by the State of Texas and the Texas Commission on Environmental Safety (TCEQ, formerly the TNRCC) as a recognized testing and repair facility for the state’s emission program. We are active participants in the AC Delco Total Service Support program (TSS), as well as the Carquest and Tech-Net programs. Colony One Auto is a proud member of Angie’s Lists, the paid review site that gives consumers the best reviews for auto services. Our outstanding rating proves we are among the best auto repair shops in the area and continue to strive to provide quality services and while maintaining our exceptional reputation. Members of Angie’s List can provide personal reviews of our services as well as see the experiences other customers and understand why our customers keep coming back to Colony One Auto. Colony One Auto is an associate sponsor of the International Automotive Technicians Network (IATN), which is an indispensable tool for networking repair information with other technicians around the world. Clean, friendly waiting area with restrooms your mother would be proud of! Priority will be given to immediate problems and you will have options on less important repairs. You decide which repairs you want taken care of and which can wait for a future visit!